Make a super simple yet beautiful invitation to create with nature and make this Easter Egg Pebble Craft together! Perfect for a range of ages (including adults!) to make gorgeous decorations or gifts for Spring. We LOVE crafts and play activities that use materials from nature as they truly produce the most beautiful results! We’ve... Read More » The post Easter Egg Pebble Craft appeared first on The Imagination Tree. Make some gorgeously soft Matcha Green Tea Play Dough using this ALL natural recipe for little hands to explore! Perfect nature sensory play for Spring or as part of a flowers and garden learning theme. Spring is here and time for a new play dough recipe for some seasonal fun and learning! I’ve been wanting... Read More » The post Matcha Green Tea Play Dough appeared first on The Imagination Tree. Make some amazing DIY I-Spy Bottles for early learning games on the go with kids! Brilliant for toddlers to school age and easy to adapt to different themes or to match learning objectives. I-Spy or discovery bottles are so easy to make and are brilliant for travel activities. I love that they are made using... Read More » The post DIY I-Spy Bottles appeared first on The Imagination Tree. Make a gorgeous DIY mini roads set for encouraging fine and gross motor development, building shapes, letters of the alphabet and hours of imaginative play on the go too! Perfect as an easy homemade gift idea, and even more brilliant when paired with a vehicle related story book. Let’s make a DIY mini roads set!... Read More » The post DIY Mini Roads Set appeared first on The Imagination Tree. Make the BEST EVER chocolate play dough with this super quick, no-cook recipe that smells A-MAZING! Perfect for sensory play, alternative Easter gifts for kids and DIY take home party favours, as well as every day invitations to play. Ok, I’ll be honest. 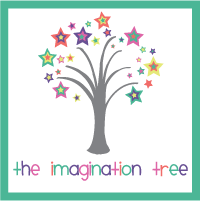 This is the THIRD post on this blog about our best ever... Read More » The post Best Ever Chocolate Play Dough Recipe appeared first on The Imagination Tree.